Eradication of the screwworm, Cochliomyia hominivorax (Coquerel), using the sterile-male technique, depends on routine, accurate and spaced release of sexually sterilized screwworm flies in adequate numbers to overwhelm the native populations. Variables affecting eradication are biology of the insect, weather and climate, soil type and terrain, husbandry practices and wound-causing pests. Operational variables affecting eradication are political and industrial cooperation and support, efficiency and quality of production and distribution, logistics and attitude. Screwworm eradication has an impact on livestock management practices, wildlife and the economy. Dr Novy is Assistant Chief of Program Evaluations and Planning of Veterinary Services, United States Department of Agriculture, 6505 Belcrest Road, Hyattsville, Maryland 20782, USA. Prior to its eradication in the United States, the screwworm, Cochliomyia hominivorax (Coquerel), existed in tropical to subtropical environments, with populations surviving the winters in southern Florida, Texas, California and Arizona (see Figure 1). Variations in the weather from year to year determined the degree of population reduction each year in overwintering areas. During the spring, summer and autumn the Screwworm population increased with a commensurate increase in territory occupied (Knipling and Travis 1937). Screwworms were commonly reported in the central United States, with occasional cases as far north as the border with Canada. Screwworms migrated 80 to 160 km in a generation, moving northward from the overwintering areas in the early spring. Higher survival in the overwintering areas during the winter months resulted in earlier and more expansive migration. Screwworm flies spread northward, fanning out and invading more territory with each succeeding generation. Hot, dry weather slowed the process, while mild and moist weather throughout the year was favourable and enhanced the expansion. The Screwworm population was highest and occupied the largest territory in the late summer and early autumn. In temperate regions of the United States the populations were destroyed by prolonged cold during the late autumn and winter months. Screwworms are a destructive obligate parasite of all warm-blooded animals including livestock, wildlife, pets, zoo animals and occasionally humans. The female screwworm fly generally mates once in a lifetime, retaining the sperm for fertilization of all subsequent egg batches. After mating she seeks an open wound on a warm-blooded animal. Eggs are laid on the edge of the wound in a shingle-like manner. Within 12 to 24 hours, tiny first-instar larvae hatch from the eggs, crawl into the wound and, closely packed with their heads down, feed on the living flesh and body fluids (Knipling, 1960). As serum and blood begin exuding from the infested wound, it becomes even more attractive to other gravid adult female screwworm flies. The result may be multiple infestations with hundreds of larvae of various ages feeding on the animal. If unabated, the process continues until the animal dies within five to ten days. After the larvae have fed for five to seven days they crawl out of the wound and drop to the ground. Larvae that survive desiccation (Baumhover, 1963) and predation burrow into the soil to pupate. The pupation period varies from seven to 60 days (Parman, 1945) according to temperature, moisture and soil type (Melvin and Bushland, 1938). Screwworm flies that survive the effects of the elements emerge as adults, then feed on wound exudates and nectar sources from flowers and are ready to mate within three to five days, thus repeating the cycle (see Figure 2). Adult survival depends on temperature. A large fluctuation in temperature during the day is detrimental, while cool, moist weather is beneficial. Some adults may live longer then 60 days if conditions are closely controlled or nearly ideal (Parman, 1945). With optimum environmental conditions, a screwworm life cycle may be completed in 24 days (Laake, Cushing and Parish, 1936). Seasonal influences on the screwworm population in the southern United States provided an advantage in livestock management practices. Since the navels of newborn animals were common sites for screwworm infestation, breeding of livestock was timed so that most newborn animals were born during the cold months when screwworm fly activity was at a low level or was non-existent. 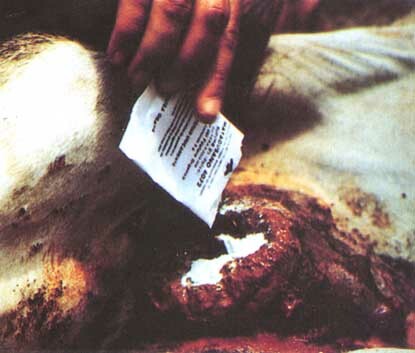 Human-induced wounds from branding, dehorning, castrating, earmarking and shearing were restricted to the cold months or to hot, dry periods of the year. Animals were inspected routinely for the presence of wounds and screwworm infestations. Larvicides were applied to wounds to kill the screwworms when present, and wounds were prophylactically treated. The effect of intensive animal inspection and wound treatment was demonstrated in Florida from 1935 to 1938, when the United States Bureau of Entomology and Plant Quarantine, in cooperation with the southeastern states, conducted a screwworm education and control programme. Using benzol and pine tar oil to treat infested wounds, screwworm infestations were reduced within one and a half years to such a low level that there were no losses of livestock (USDA, 1959). The programme could not be sustained and screwworms could not be eradicated because wildlife and non-attended domestic animals served as reservoirs. The theory that screwworm populations could be suppressed by releasing factory-reared screwworm flies that could transmit detrimental survival traits to their counterparts in nature was discussed by Knipling and Bushland in 1937 (Knipling, 1985). United States Department of Agriculture (USDA) scientists demonstrated that both sexes of screwworm flies could be made sexually sterile by irradiating them as pupae (Bushland and Hopkins, 1951,1953). When the sterilized males were in competition with normal males, the ratio of sterile-to-fertile egg masses deposited by normal females was essentially equal to the ratio of sterile-to-fertile males caged with the females. A field trial was conducted on Sanibel Island, Florida, which is separated by 3 km of water from the mainland peninsula. Sterile males were released weekly at the rate of 38 sterile male screwworm flies per square kilometre for several months on the 36 km² island. As much as 80 percent of the egg masses collected from goats in the release area were sterile (failed to hatch), but eradication could not be demonstrated because of the immigration of normal, mated female screwworm flies from the mainland. USDA scientists next arranged a screwworm eradication experiment against a completely isolated population on the island of Curaçao, Netherlands Antilles. The island covers an area of 440 km² and is 65 km from the coast of Venezuela. Screwworms were mass-reared in a facility near Orlando, Florida. Irradiated pupae were shipped by air to Curaçao, and the emerged flies were released by a single-engine plane flying 1.6 km wide swaths over the island. Each week 300 sterile flies were released per square kilometre during the eradication phase. Within less than six months from the initiation of the experiment, screwworms were eradicated from the island of Curaçao, in 1954 (Baumhover et al., 1955). With the successful eradication of screwworms from the island of Curaçao, using the new sterile male technology, there was increasing pressure by the Florida Livestock Board during 1955-57 to eradicate the screwworm from the southeastern United States. A 5000-km² test zone in southern Florida with a high incidence of screwworm infestations was selected as a mainland field trial. The zone was treated weekly with 400 sterile flies per square kilometre. Because immigration of mated female screwworm flies into the test zone from the untreated area was likely, eradication was not expected. Rather, the scientists anticipated a high weekly egg mass sterility level of 50 percent. After three months of sterile insect releases, the level of egg mass sterility reached 70 percent near the centre of the test zone, and the natural population in the test zone appeared to have declined by about 90 percent (Baumhover, 1966). Based on the field trials, it was calculated that at least 50 million sterile flies per week, distributed over an area of 130000 km², would be required to eradicate screwworms from the southeastern United States. The winter of 1957-58 was one of the coldest in history in Florida. To take advantage of the resulting reduction of the screwworm population, the research facility at Bithlo, Florida expanded its production from 2 to 14 million sterile flies per week (Graham and Dudley, 1959). The distribution of the sterile flies in the southern Florida peninsula further reduced the screwworm population that survived the winter and was responsible for slowing the migration north during the spring and summer. A new rearing facility was constructed near Sebring, Florida and initiated operations in July 1958. Within three months the weekly production of sterile flies from this new facility was in excess of 50 million per week, with an average of 50 to 75 million per week for the duration of the eradication programme (Smith, 1960). Sterile flies were packaged in boxes, with 400 flies per box, which were dispersed at the rate of 76 to 304 sterile flies per square kilometre from single-engine planes flying about 500 m above the terrain. Planes flew over treatment areas in Florida, southern Georgia and southern Alabama each week on 3.2 km-wide swaths on a grid pattern. Sterile fly distribution was supplemented by a field organization that inspected livestock, educated livestock owners and practicing veterinarians, investigated reported screwworm infestations and monitored sterile and native fly activity through use of liver-baited traps. Florida agriculture officials operated a quarantine line across the northern part of the state where all livestock moving north were inspected and permitted movement only if they had been sprayed with insecticide at the point of origin. USDA officials operated a quarantine line along the Mississippi River from Memphis, Tennessee south to the Gulf of Mexico where all livestock moving from west to east were inspected and treated to prevent transport of screwworms to the eradication area. The last reported screwworm infestation in the southeastern United States was reported in Florida in 1959 (Meadows, 1985). As a result of producer interest, the eradication programme was expanded to encompass the southwestern United States (Scruggs, 1975), (see Figure 3). Objectives were to prevent the reintroduction of screwworms into the southeastern United States; to eradicate screwworms from Texas, Arizona and California; and to prevent reinvasion into the United States from Mexico. Estimates of the screwworm population in any given year are based on the number of infested animals, referred to as cases. Prior to 1962, livestock owners estimated that one million cases were treated in Texas in a normal year. Thousands of cases were reportedly treated each year in Louisiana, Arkansas, Oklahoma, Kansas and Missouri as a result of the migration of screwworms from Texas. In 1961 a massive educational campaign was conducted. Hundreds of thousands of sample vials and forms to be completed were distributed to livestock owners. They were instructed to collect a sample of larvae from each animal treated for a suspected screwworm infestation and to return the sample and form with pertinent data to the designated laboratory for identification. The winter of 1961-62 was very severe, and the screwworm population in the overwintering area was reduced to an unusually low level. Taking advantage of this natural suppression, the USDA Research facility at Kerrville, Texas began production of sterile flies in February 1962. Weekly production was initially 5 million but increased to over 22 million flies by May 1962. Sterile flies were dispersed at the rate of 80 per square kilometre over central Texas. The effects were monitored by collection of egg masses from wounded sheep, and as many as 75 percent were found to be sterile (Bushland, 1985). In June 1962, production of sterile screwworm flies began in a new plant in Texas. The flies were initially distributed over 388500 km² of Texas and New Mexico and in a band extending 80 km south of the Texas border into Mexico. Production of flies gradually increased from 28 million per week in July to 75 million per week by October 1962. Subsequently during 1963 many livestock owners found no screwworm-infested animals on their ranches for the first time in modern history, and in 1964 Texas and New Mexico were declared free of endemic screwworm infestation. The screwworm population remained low in the southwest because of hot, dry weather much of the year, and for the first time in recent history no cases were reported in Oklahoma, Arkansas and Louisiana. The programme was extended into Arizona in 1964. Sterile flies in the pupae stage were transported 24 hours by refrigerated truck trailer at 10°C to delay emergence. Pupae were packaged, and the emerged adult sterile flies were distributed over Arizona and northwestern Mexico. As a result, only 158 screwworm cases were reported from Arizona, compared to the several thousand cases reported annually in previous years. California was added to the programme in 1965, thus forming a complete barrier with strategic and selective distribution of sterile flies each week along the Mexico-United States border from the Pacific Ocean to the Gulf of Mexico, an expanse of about 3200 km (see Figure 4). Unfavourable weather for screwworm survival for at least three months of each year eliminated the need to release sterile flies over the entire expanse all through the year. The highest screwworm populations were on the east and west coasts of Mexico, and sterile fly dispersals were concentrated in these areas during the winter months. This reduced the screwworm population in areas adjacent to the border with the United States and delayed the spread of screwworms northward each spring. Approximately 80 percent of the production of sterile flies was distributed along the eastern half of the United States border, where more animals were at risk and where the climate was more suitable for screwworm than in New Mexico, Arizona and southern California. By the end of 1966, further economy measures were taken. Boxes containing 2000 instead of 400 sterile flies were used, and the weekly fly dispersal swaths were widened to 16.1 km. Sterile fly production was increased in 1967; 155 million flies were released weekly. This increase, combined with hot, dry weather in New Mexico, Arizona and California, helped keep the screwworm population low. The winter of 1967-68 in Texas was cold, and no screwworm cases were reported for the first three months of 1968, but favourable weather conditions contributed to a steady increase in infestations during the year until cooler weather again reduced the area and numbers by November. From 1969 to 1971, livestock owners and officials worked hard to improve screwworm case reporting from northern Mexico and the United States. An intensive educational campaign by the Agricultural Extension Service supported livestock owners in their continuing need to inspect animals, to treat screwworm infestations, to treat wounds as a prevention and to avoid making wounds. Another cold winter in 1969-70, following a year when the screwworm population was already low, created an almost ideal situation in 1970. Texas remained nearly screwworm-free that year, except for a summer outbreak in one area. Dry weather continued in southern Texas during the first half of 1971. Livestock movements out of this drought-stricken area in April or May 1971 were implicated in the introduction of screwworms into the Red River Valley in extreme northeast Texas (Novy, 1979), more than 1300 km northeast of the previous reported screwworm infestations that year. The first case, reported toward the end of June, probably resulted from the second or third generation of screwworms after introduction into the area. From June to October 54 cases were reported, confined to an area 16 km north-south and 40 km east-west, with the Red River passing centrally through the infested area. Most livestock in the area were sprayed with coumaphos insecticide at least twice in July and August as a preventive measure. Sterile fly releases were made from June to October at the rate of 3000 to 3800 per square kilometre on 1.6 to 3.2 km-wide swaths. Three tropical storms moved inland along the Texas and northeastern Mexico Gulf Coast in the late summer and autumn of 1971. There was an abundance of rain. The screwworm population began to build up despite releases of 1140 to 1520 sterile flies per square kilometre, averaging 135.3 million weekly. Livestock owners had reduced the amount of labour and the use of trained horses over the years because screwworms were under control. The number of absentee livestock owners had increased and cattle populations in southern Texas had increased 43.7 percent from 1959 to 1972 and 37.2 percent from 1964 to 1972. Deer populations had also increased because of the lack of screwworms, and brush clearing with improved range conditions allowed the land to support the increasing animal population. Warmer than normal weather during the winter of 1971-72 contributed to an exceptionally high screwworm population in northeastern Mexico. Screwworm survival in southern Texas was also significant. The number and range of screwworm-infested animals in Texas increased rapidly during the first four months of 1972. Maximum production in Texas of 205.5 million flies per week was achieved in May 1972 to counter the outbreak, but screwworms multiplied in record numbers in south Texas and spread to all areas of Texas by mid-April. By mid-May, the screwworm situation was completely out of hand. Perhaps even if maximum production had been achieved earlier, it would have had little effect because of the existing favourable conditions. The population of screwworm flies migrating north from northeastern Mexico was too large to be sufficiently outnumbered by the production and distribution of sterile flies. Sterile fly releases continued from May to the end of 1972 in east Texas, Louisiana and Arkansas, and the programme was successful in preventing reintroduction of screwworms into the southeastern United States. During this outbreak in 1972, the swath widths were narrowed to 8 km to improve effectiveness of distribution. Prior to 1965, livestock owners and Mexican and United States government officials recognized that until screwworms were eradicated from the adjacent areas of Mexico, the southern United States would continue to be reinfested each year. A national survey and feasibility study of eradication of screwworms was jointly conducted in Mexico during 1965 and 1966. Plans were made to construct a new sterile fly rearing facility in southern Mexico to provide the production necessary for the eradication programme and to maintain a sterile fly barrier at the Isthmus of Tehuantepec. The interest in the eradication of screwworms from Mexico was heightened following the large number of screwworm infestations in the United States in 1968, but the disastrous invasion of screwworms in the United States in 1972 demonstrated the need to embark urgently on a programme to eradicate screwworms from Mexico. In August 1972 an agreement between Mexico and the United States was signed establishing a joint programme, and both governments moved rapidly to begin the construction of the new rearing facility in southern Mexico. In 1971 a trial was initiated to evaluate the sterile male technique in a tropical environment similar to that of central and southern Mexico. Arrangements were made with the United States Air Force to utilize flights scheduled for training missions to transport sterile flies from the rearing facility near Mission, Texas to the island of Puerto Rico. Initially, 2.2 million pupae were transported weekly for almost two years. The sterile insects were dispersed over the islands of Mona, Culebra, Vieques, and the United States and British Virgin Islands, as well as the island of Puerto Rico. Sterile egg masses were collected from wounded animals, and fly traps were used to evaluate the effects of the sterile fly dispersals. Local populations of screwworms were collected in Puerto Rico for production of sterile flies to be compared with those originating from Texas. After the initial two-year programme, screwworms had been eradicated from the United States and British Virgin Islands and from the islands of Mona and Culebra. Sterile flies from collections in Texas were as effective as local collections for the eradication of screwworms in the tropical environment of Puerto Rico, where it was necessary to increase the dosage from about 400 sterile flies per square kilometre to 1500 to 2000 per square kilometre. Consequently, the weekly number of flies dispersed over Puerto Rico and Vieques from July 1973 to May 1975 was increased to about 13.5 million. With the conclusion of the programme, screwworms were eradicated from Puerto Rico and the neighbouring islands. The experience gained both in eradication from a tropical environment and in long-range aerial transport of the flies was to be valuable in the eradication programme in Mexico. From 1971 to the end of 1976, winters were gentle and summers mild in the southwest United States and northern Mexico, with above normal precipitation. Probably because of the favourable weather, the Gulf Coast ear tick, Amblyomma maculatum (Koch), began to increase and spread, infesting large areas in Texas in 1972. 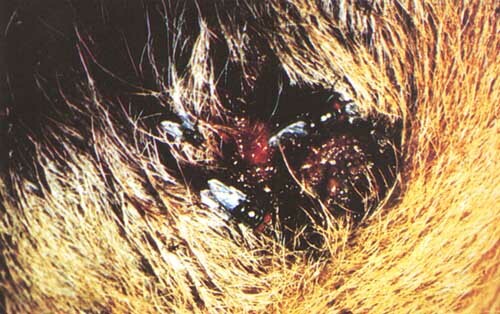 Ticks created wounds for screwworms in record numbers from late July to the end of October each year from 1972 to 1976. These additional wounds for screwworm oviposition contributed to additional loss of effectiveness in screwworm control. Interest in the development of new and improved screwworm control methods resulted, for example, in the control of the Gulf Coast ear tick by insecticide-impregnated plastic ear tags for cattle. Sterile fly production at the Mission, Texas facility continued at nearly 200 million weekly during 1972-75. In 1975 and 1976 production of sterile flies was reduced to 165 million weekly as an economy measure, and reported cases increased to significant levels. In August 1976 the new sterile fly rearing facility in southern Mexico was opened. Production of sterile flies increased from 2.5 million initially to over 10 million weekly in October, 100 million weekly in November and 200 million weekly in December. About 20 million sterile flies were transported weekly by air to the southern Baja California peninsula in northwest Mexico for packaging and distribution. Sterile flies were also transported by plane to dispersal bases in northern Mexico and the southern United States. Production at the rearing facility near Mission, Texas was increased to an average of about 200 million flies per week beginning in September 1976 and continued at that level until October 1978. 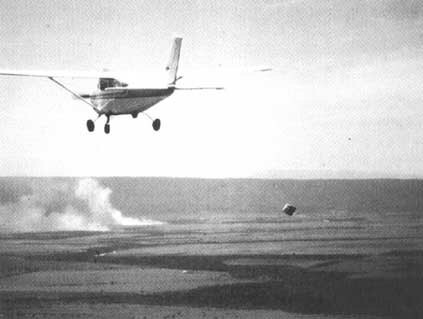 The eradication programme in the United States reverted to the use of single-engine planes for dispersal, and the swath widths were reduced to 3.2 km on the grid patterns that were flown each week. The number of sterile flies in each release box was reduced from 2000 to 400. Larger planes and the larger fly release boxes continued to be used in Mexico. Production at the Mexico rearing facility was increased again in 1978 and 1979 to over 300 million weekly; these flies were combined with sterile flies from the Texas rearing facility and dispersed over the southwestern United States and northern Mexico. The control was dramatic. Only 39 screwworm cases were reported from Texas in 1977. In 1977-78 the winter was unusually wet and mild in northwest Mexico, southern California, Arizona and New Mexico. Screwworm populations increased and spread over an extensive area affecting five states in the southwest United States. As weather conditions returned to a more normal pattern in 1979, progress was made toward eradicating screwworms from all of northwest Mexico, and the last cases of screwworm in California, Arizona and New Mexico were reported before the end of 1979. Production of sterile flies during 1979 was reduced to below 150 million per week at the Texas rearing facility. Phasing out of eradication activities in the United States began. In 1980 there were only two and in 1981 five screwworm cases reported. One of the cases in 1981 was an infested dog brought back to the United States from Mexico. Although the Texas production facility was closed down in January 1981, it was kept available as a backup to the rearing facility in southern Mexico. The Mexico facility increased production of sterile flies to over 400 million per week after this, and in ensuing years it produced as many as 550 million per week for the eradication programme in Mexico. On 30 August 1982 the last case of screwworm in the United States was reported. In Mexico the programme initiated inspection and treatment of animals moving north from infested zones into screwworm-free zones. With the continuous distribution of sterile flies, screwworms were gradually eradicated from regions further from the United States border, until by the end of 1984 all of Mexico north of the Isthmus of Tehuantepec was free of the pest (see Figure 5). A sterile fly barrier zone and an animal inspection and quarantine programme in southern Mexico has maintained this area pest free except for two isolated outbreaks in 1985. Further south, the eradication campaign has progressed into the rest of Mexico, Guatemala and Belize. At present, nearly all of Mexico is free of the screwworm, and the incidence in Guatemala and Belize has been significantly reduced. Surveillance to prevent reintroduction of screwworm into the southern United States has continued, and the Animal and Plant Health Inspection Service maintains laboratory identification facilities. Articles are frequently published to remind livestock owners and practicing veterinarians to report any suspected case of screwworm immediately. The importance of this surveillance was demonstrated when a dog taken to Venezuela was found to have a screwworm infestation after its return to the United States in April 1987. Sterile flies were dispersed weekly for six weeks within an 80 km radius of the premises where the dog had been kept before the infestation was diagnosed and treated. Surveillance was intensified for several weeks around the immediate locations where the dog had been. No additional screwworm infestations were found. Another dog and its owner re-entered the United States from Honduras by commercial airline in August 1987. The dog was subsequently diagnosed and treated for a screwworm infestation. Again sterile flies were dispersed around the locations in Louisiana and Florida where the dog had been, and intensive surveillance was conducted for several weeks. No other animals were found with screwworm infestation. In September 1989, a horse returned to Puerto Rico after competing in a jumping event in Venezuela and was subsequently diagnosed and treated for a screwworm infestation. Sterile flies from Mexico were dispersed weekly for six weeks around the areas in Puerto Rico where all the horses and transport vehicles had been. Intensive surveillance for several weeks failed to detect any locally infested animals with screwworm. At present, Puerto Rico, the United States and most of Mexico are free of screwworm, but the risk of reintroduction from other countries through the movement of animals is ever present and requires continuous vigilance. Livestock producers in the southern United States have benefited from freedom of screwworm by reduced costs in management and labour. They have also benefited from the related increase in wildlife populations, since revenue from hunting leases is a major source of income for many livestock producers. Prior to eradication, during the screwworm season animals were inspected frequently. Any open wound on an animal was treated with insecticide, and animals with infestations were maintained in pens for three to four days of treatment. This entailed labour, insecticide, facilities and the use of trained horses. On the vast rangelands of the southwest, horseback riders were made solely responsible for inspecting and treating the animals. Animals with screwworm infestations often separated from the herds to seek shade, making them difficult to locate on the vast rangelands. Annual losses of 10 percent were estimated on Texas ranches. Even after treatment, many of the animals that recovered would have damaged hides or other disfigurements, and the sale value of the animals would be reduced. It has been reported that up to 80 percent of the fawn crop of white-tailed deer was lost during years of heavy screwworm infestation on one ranch in southern Texas. In 1961, the estimated cost in Texas of one deer weighing 57 kg was US$125, and the lost revenue in hunting fees was valued at US$30 million annually (Scruggs, 1975). Following the eradication of screwworm from Florida the deer population more than doubled, and in Texas the deer population increased more than threefold over that of 1960. 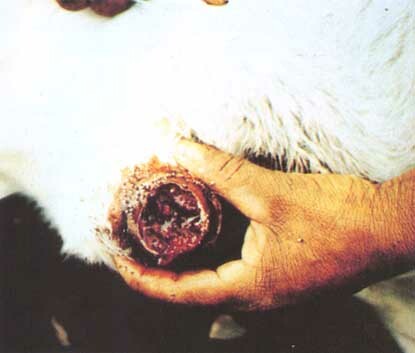 In 1957, prior to eradication, screwworm was considered to be costing the livestock industry of the southeast over US$20 million annually (Meadows, 1985). Similarly, in 1960, estimated livestock losses due to screwworm in the southwest were placed at more than US$100 million annually. An economic study in 1972 estimated that screwworm reinfestation in the south of the country would cost the livestock industry US$372 million (Prater and Goodwin, 1972). In 1981 it was estimated that beef production would be reduced by 1.5 percent and that the per caput price of beef would increase by US$1.66 if screwworm were to reinvade the southern states (Plaxico, personal communication). Lost production, animal losses, and labour and treatment costs from infestation in 1976 were estimated at US$113.7 to 150.6 million (Cocke, 1981). The allocation of funds for the eradication programme in 1976 was approximately US$15 million. Considering that potential losses from screwworm had been estimated at US$375 million, there was a significant return for the cost of the eradication programme even during a year with a serious and widespread outbreak. It has also been estimated that the economic benefit to livestock producers from screwworm control between 1962 and 1976 was in excess of US$1000 million. Screwworm was a costly problem, of great economic importance to the livestock industry, consumers and wildlife interests, and eradication has proved a sound investment. Baumhover, A.H. 1963. Susceptibility of screwworm larvae and prepupae to desiccation. J. Econ. Entomol., 56: 645-649. Baumhover, A.H. 1966. Eradication of the screwworm fly - an agent of myiasis. J. Am. Med. Assoc., 196: 240-248. Baumhover, A.H., Graham, A.J., Bitter, B.A., Hopkins, D.F., New, W.D., Dudley, F.H. & Bushland, R.C. 1955. Screwworm control through release of sterilized flies. J. Econ. Entomol., 48: 462-466. Baumhover, A.H., Husman, C.N. & Graham, A.J. 1966. Screwworms, insect colonization and mass production, Ch. 37. New York, Academic Press. Bushland, R.C. 1985. Eradication program in the southwestern United States. Symposium on eradication of the screwworm from the United States and Mexico. Misc. Pub. Entomol. Soc. Am., 62: 12-15. Bushland, R.C. & Hopkins, D.E. 1951. Experiments with screwworm flies sterilized by X-rays. J. Econ. Entomol., 44: 725-731. Bushland, R.C. & Hopkins, D.E. 1953. Sterilization of screwworm flies with X-rays and gamma-rays. J. Econ. Entomol., 46: 648-656. Cocke, J. 1981. New advances against the screwworm. Texas Agricultural Extension Service, Publication L-1089. College Station, Texas, Texas A & M University. Graham, A.H. & Dudley, F.H. 1959. Culture methods for mass rearing of screwworm larvae. J. Econ. Entomol., 52: 1006-1008. Knipling, E.F. 1960. The eradication of the screwworm fly. Sci. Am., 203: 4-48. Knipling, E.F. 1985. Sterile insect technique as a screwworm control measure: the concept and its development. Symposium on eradication of the screwworm from the United States and Mexico. Misc. Pub. Entomol. Soc. Am., 62: 4-7. Knipling, E. F. & Travis, B.V. 1937. Relative importance and seasonal activity of Cochliomyia americana. J. Econ. Entomol., 30: 727-735. Laake, E.W., Cushing, E.C. & Parish, H.E. 1936. Biology, of the primary screwworm fly, Cochliomyia americana, and a comparison of its stages with those of C. macellaria. USDA Tech. Bull. No. 500. Washington, D.C., USDA. Meadows, M.E. 1985. Eradication program in the southeast United States. Symposium on eradication of the screwworm from the United States and Mexico. Misc. Pub. Entomol. Soc. Am., 62: 8-11. Melvin, R. & Bushland, R.C. 1938. Effect of acidity, alkalinity, and moisture content of the soil on emergence of Cochliomyia americana. J. Econ. Entomol., 31: 611-613. Novy, J.E. 1979. Operation of a screwworm eradication program. In R.H. Richardson, ed. The screwworm problem, evolution of resistance to biological control. Austin, Texas, University of Texas Press. Parman, D.C. 1945. Effect of weather on Cochliomyia americana and a review of methods and economic applications of the study. J. Econ. Entomol., 38: 66-76. Prater, T. & Goodwin, J. 1972. Economic study on the cost-benefit ratio of the screwworm program. Lincoln-Eden Report, Animal and Plant Health Inspection Service. Washington, D.C., USDA. Scruggs, G. 1975. The peaceful atom and the deadly fly Austin, Texas, Jenkins Publishing Company, Pemberton Press. Smith, C.L. 1960. Mass production of screwworm (Callitroga hominivorax) for the eradication program in the southeastern states. J. Econ. Entomol., 53: 1110-1116. USDA Agricultural Research Service. 1959. Report on the screwworm problem in the southwestern United States and northeastern Mexico with comment on control and eradication. Cooperative Economic Insect Report. Washington, D.C., US Government Printing Office.